Winter can be so drab! The grey skies, cold weather and snow. But remember how you LOVED snow as a kid? Today we’re featuring a real birthday party that not only embraces winter, but turns it into a cheery and bright theme perfect for any winter birthday celebration! This charming first birthday is the creation of Kim Stoegbauer, the talented designer, party planner and owner of TomKat Studio. With aqua and red, Kim brings this snowflake birthday to life for one very lucky birthday girl. Take a look. A very special thank you to Kim and Live Love Photography for sharing this party with us! Read more about all of the delightful details here on Kim’s blog. Oh, this party is adorable! Loving the aqua and red together. What a party!! What a beautiful display! All the details came together so perfectly. I love the color combo for a festive winter-time event. Thank you for the gorgeous inspiration! This party truly is perfect. And the birthday girl is too adorable. Love that frilly skirt. I love the idea of including donut holes in the dessert buffet. No baking and the kids love them. AND they fit perfectly with the theme… all powdery and white, just like snow. Great job Kim! She is wonderful isnt she? I follow her blog regularly for a sweet lift during the week. Love your site and TomKat’s site! So cute, and I agree with Barbara about the donut holes – they look adorable! Arriving via Kim’s blog at TomKat studio, I love the feature and have had a good wander through your posts – sensational & inspiring! 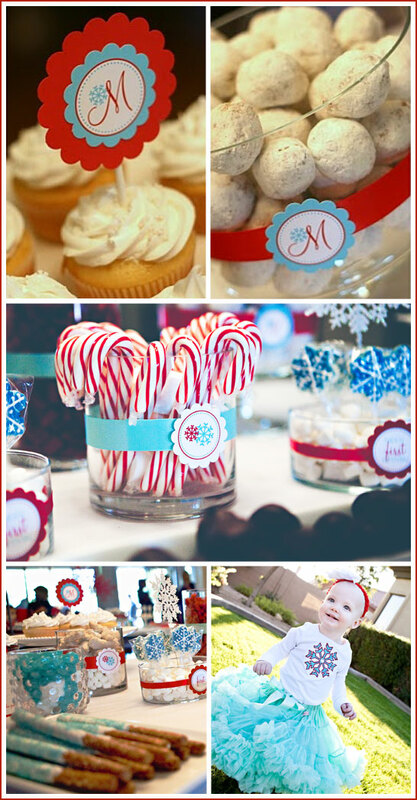 I loved this party when I saw it on Kim’s blog! She is a talented woman! I agree 110%!! Kim’s talent is more than inspiring. I was thrilled to share her party on Half Baked! Thanks again Kim! I LOVE this!! Our daughter (1st girl of 2 boys) was born in december and has red hair! 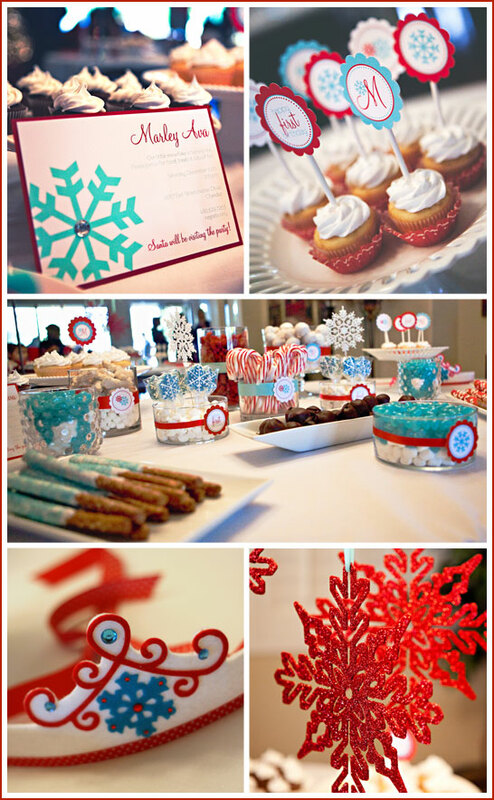 I have been looking to do a “Redheaded snowflake” Birthday theme for her first birthday and this is Perfect!! Thank you so much!! !